Mazda Motor Corporation has developed a new body colour, Soul Red Crystal, to symbolize its KODO—Soul of Motion design. The new colour will debut on the all-new Mazda CX-5, on sale in Japan from February next year, before being rolled out to new and existing models. In the belief that "colour is an element of form," Mazda has focused on developing colours that highlight the beauty and quality of its KODO designs. Soul Red Crystal is an advanced version of Soul Red that balances vibrant energy and vividness with clear depth and gloss. It boasts 20 percent greater colour saturation and 50 percent more depth than Soul Red, for a fresher, lustrous transparence. The paint retains a simple three-layer structure comprising clear, translucent and reflective coats, but represents an evolution of Mazda's Takuminuri painting technology. Takuminuri gives mass-production vehicles a precise, high-quality finish that looks like it has been hand-sprayed by a master craftsman. It has been used previously with Soul Red and Machine Grey. The new paint's translucent layer features a newly developed highly saturated red pigment for a richer red. 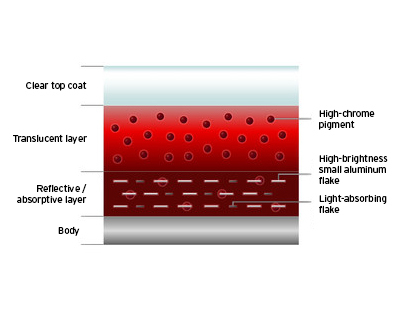 In addition to high-brilliance, extremely thin aluminum flakes, the reflective coat features light-absorbing flakes that intensify shaded areas and make it possible to achieve a depth of colour that previously required two layers. The aluminum flakes were made a uniform size, the consistency of the paint was enhanced and a technique to shrink the volume of paint during the drying process was employed. This results in even, smooth coverage of the aluminum and light-absorbing flakes on the car's body and more precise control of light reflection, making for a substantially deeper and more vivid colour. In the belief that "colour is an element of form," Mazda will continue to develop new colours and paint technologies, and work to be a brand that maintains a strong emotional connection with customers.